Clogged drains are one the most common plumbing problems that homeowners have to deal with. When you notice that water is pooling around your drain, this is a sign that your water pipes are clogged. Pipes can become blocked incredibly easily, and their performance can become highly hindered just by certain items going down the drain. 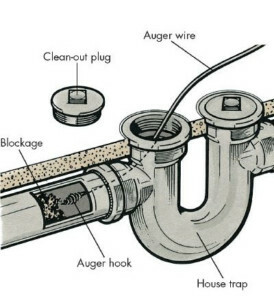 If you want to avoid clogged drains in your home, it’s important for you to know what’s prohibited and what’s not when it comes to putting stuff down your drains. No homeowner wants to have a clog in their pipes. This issue can bring a lot of stress and disturbance to a household. A blockage can cause some plumbing appliances such as baths and showers to become out of use, causing disruption to your daily routines. Avoid having to call a plumber in Weatherford TX by learning how to look after your pipes properly. Grease – When you’ve been cooking something greasy or oily in your kitchen, and you have leftover oil or grease, do not pour it down your drain. These liquids stick to your pipes, and when other forms of debris find their way down the drain, they get stuck to the grease and oil. Eventually, you’ll create a stubborn clog, and your home will be suffering from the effects. When disposing of grease or oil, pour them into an old bottle, yogurt pot, chip packet or anything that can hold liquid and throw it in the garbage. Trash can – Besides toilet paper, you shouldn’t flush any other product down your toilet. Items such as tampons, sanitary towels, baby wipes, cotton balls or pads, diapers and much more have not been designed to get flushed away. As toilet paper in flushed, it soaks up the water, becomes fragile and quickly breaks up. The other listed items do not properly dissolve and can cause a large clog if you frequently flush them. Keep a trash can in your bathroom for these types of things. Solidifying – Be careful with what you put down your drain. Just because it’s in liquid form when you pour it down, doesn’t mean that it will stay as a liquid. Substances such as paint, wax and glue can solidify in your pipes and cause clogs. Strainers – Hair is one of the biggest reasons drains get clogged. When you’re washing your hair in the shower or bathtub, all of your loose hairs get washed away. To avoid hair-ridden blockages, you should get strainers installed on all of the drains around your home. They won’t just stop hairs from getting into the pipes; they’ll also prevent other solid items such as food from going down. Make sure you clean them on a regular basis to remove all of the dirt that’s it’s collected. Disposal – When you’re finished using your garbage disposal, make sure that the pipes are clear by running cold water down it for fifteen seconds or more. If there is any food or debris remaining inside, the water will remove it. So if you can’t fix it yourself give Lightfoot Plumbing a call.